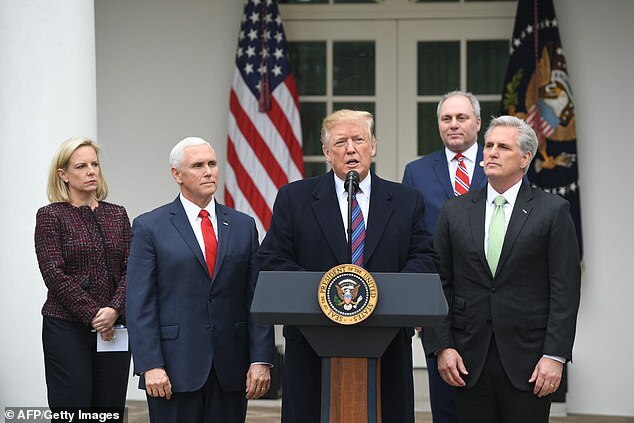 Donald Trump told Congressional leaders Friday that he will shut down the government for ‘months or years’ if he does not get money for his Mexican wall in a heated confrontation at the White House. Trump’s threat was disclosed by Chuck Schumer, the Democratic Senate minority leader, who accused the president of holding federal workers ‘hostage’ for the wall. 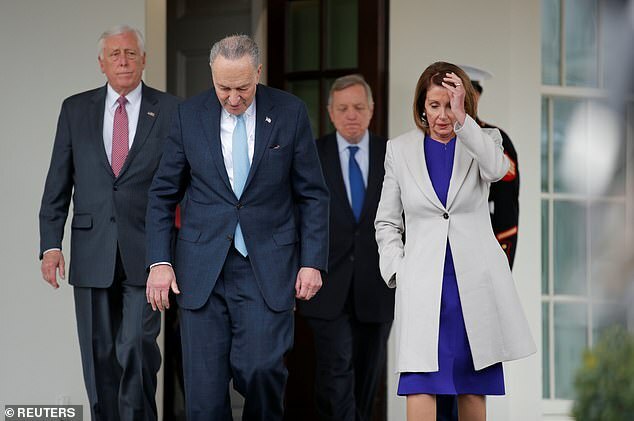 Schumer, the new Speaker Nancy Pelosi, their deputies and their Republican opposite numbers had gone to the White House for talks with Trump as the shutdown entered its 14th day. But as she left Pelosi told reporters the talks were ‘at times contentious’ and when asked if there had been progress responded: ‘How do you characterize progress? 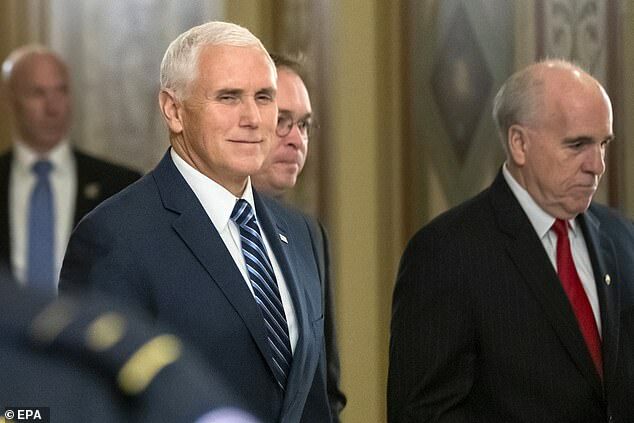 There was no mention from the Democratic leaders of a possible deal floated by Vice President Mike Pence, who had suggested that the president could use a program giving legal status to illegal immigrant children as an incentive for Democrats to give him is border wall. Pence said that Trump’s stance heading into a Friday morning meeting with congressional leaders is ‘no wall, no deal,’ but he’s willing to negotiate other aspects of an agreement to reopen the government. ‘I think the president’s made it very clear — no wall, no deal,’ he told Tucker Carlson after the Fox News host asked about the Deferred Action for Childhood Arrivals program. ‘But look, we really are prepared to negotiate, we’re prepared to talk, we’re prepared to listen,’ he added. Pelosi has said that DACA alone is not enough for her caucus to give the president his border wall funding. He’s asking for north of $5.6 billion at this point. The president may be preparing to offer it to Democrats anyway as he takes one last shot at getting the government back on track before the end of the current pay period on what is now the fourteenth day of the partial, federal shutdown. Pelosi said Thursday that she’d be willing to give the president a dollar for the wall to get the government back open, but she was only half-seriously responding to a reporter’s question about the potential for an agreement. 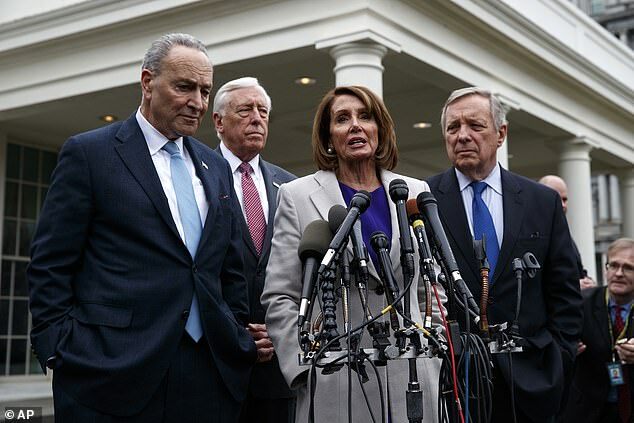 House Democrats passed bills providing no money for the wall last night that would fund the Department of Homeland Security for a little more than a month. The White House has said that Trump would not sign the legislation, and the Senate did not bother to put it on the floor. As leaders departed the Capitol for their meeting on the other side of town with Trump, the Senate adjourned until Tuesday morning, ensuring that the government shutdown would continue for at least three more days. 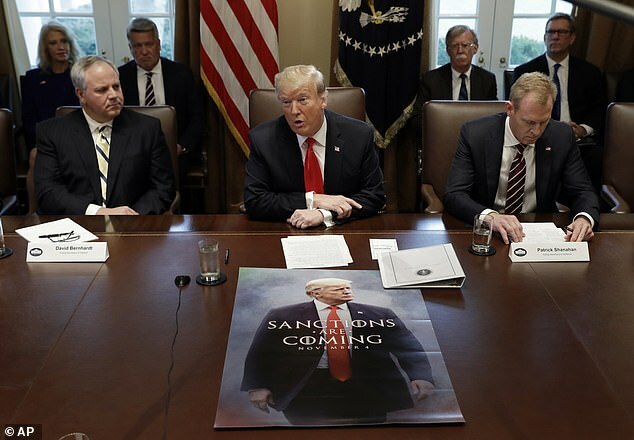 Trump meanwhile sent each Member of Congress a slideshow prepared by the Homeland Security Secretary Kirstjen Nielsen that the White House previously suggested was so sensitive that it could only be viewed in a classified setting. GOP leaders and the White House also complained that Pelosi and Schumer walked out of the Wednesday briefing early and rudely interrupted the president’s Cabinet secretary. The White House said in a Friday statement that Trump had sent the slideshow briefing to every member of Congress, as such. It also shared the presentation with the media. It was not immediately clear on Friday why the presentation needed to take place in the Situation Room of the White House if the information could be distributed far and wide. It is usually used for classified meetings. Trump made his first appearance behind the podium in the White House press briefing room on Thursday afternoon to plug his border wall on camera. He left without taking questions ten minutes later to the shock and dismay of assembled press. He seemed to be ginning up to have the last word on Friday, as his White House set up the Rose Garden with sound equipment. He let House Majority Minority leader Kevin McCarthy and House Minority Whip Steve Scalise do the talking for him on Wednesday after his Situation Room briefing at a press conference in front of the White House. Democrats also spoke to press from the president’s driveway, reiterating in their remarks that they will give him no money for the wall. The White House has repeatedly suggested that Pelsoi would loosen her grip on border wall funding once she was formally named speaker. Trump has repeatedly claimed that Democrats are refusing him to have a platform to run on in 2020. But the California Democrat was firm in her resolve that wall funding was not coming on Thursday evening, and she insisted it is not political gamesmanship.